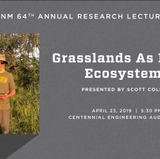 For the second year in a row, business, academic and economic development and government leaders from the city, state and region will converge at The University of New Mexico to meet with recent highly-trained STEM professionals who are in and out of New Mexico. 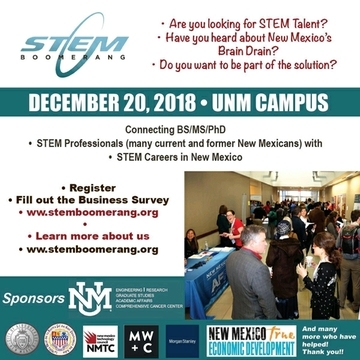 STEM Boomerang will be held Dec. 20 at the Student Union Building at UNM. A reception will be held on Dec 19, and UNM President Garnett Stokes will give the welcome address on Dec. 20. A detailed agenda will be announced soon. Participants are encouraged to register and fill out a brief survey in advance of the event. The purpose of STEM Boomerang is to connect the dots between the many highly-paid job opportunities that exist in New Mexico in the science, technology, engineering, mathematics (STEM) and other technical areas and graduates from New Mexico who may believe that the state has little to offer its STEM professionals. 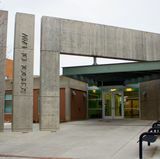 The conference is scheduled for right before the holidays by design so that New Mexico STEM professionals who live here and elsewhere can more easily connect as they are returning to the state to be with friends and families for the holidays. At the inaugural symposium in December 2017, more than 200 people attended, including 115 STEM professionals, 75 percent of them from outside of New Mexico. More than half the participants had Ph.D.s, and about half were ready to begin jobs in the tech sector within the year. Werner-Washburne said about a dozen STEM Boomerang participants have been placed, and more are in the works. More than 30 companies attended in 2017, to recruit, including Sandia National Laboratories, Los Alamos National Laboratory, Air Force Research Laboratory, Applied Technology Associates, Indicia Labs and Lavu. STEM Boomerang will also present a series of webinars, starting in November, that will cover career options, interviews, and direct meetings with New Mexico employers from startups to the national laboratories. UNM is a Titanium sponsor for the 2018 STEM Boomerang. 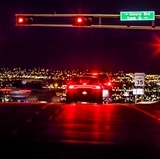 It is also sponsored by many different organizations, including the cities of Albuquerque and Santa Fe, the New Mexico Economic Development Department, the New Mexico Technology Council and others. Sponsorship opportunities are still available. Werner-Washburne said the eventual goal is to have STEM Boomerang events and webinars throughout the year and make finding and building a career in STEM in New Mexico a great experience from start to finish. Find out additional information and the latest information at stemboomerang.org.